An application that allows students to collaborate on making music and doing audio recording is getting an education treatment, including integration with Google's learning management system. Soundtrap, from a company of the same name, works on multiple kinds of computing and mobile devices to enable one or more people to play and record music online. Users can plug in their own instruments, use the virtual ones provided on Soundtrap, or record a song directly with an external microphone. When the recording is finished, it can be uploaded to social networks for free or onto Spotify or iTunes for a charge. 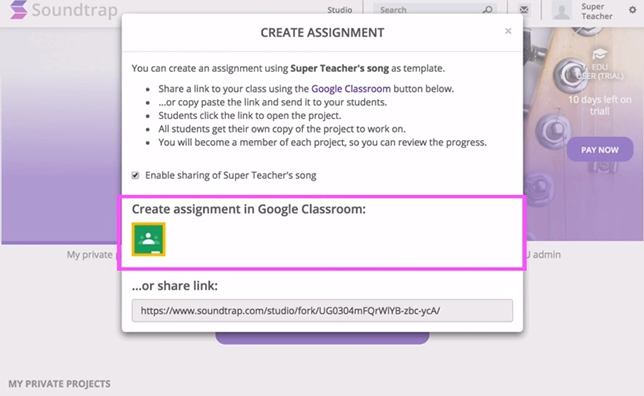 Soundtrap for Education allows teachers to set up assignments in Google Classroom. The new Soundtrap for Education adds features suited for school use. It was demonstrated last week at FETC 2016, an education technology conference in Orlando. The software is compliant with the Children's Online Privacy Protection Act (COPPA), and group recordings can be done with students from within an "invited" and secure group. Teachers set up the groups and invite participants using a link, from within Google Classroom or by importing users through a CSV file. Teachers can create private areas for a single class, a school or a mix of classes and schools. They can have an entire class participate in a performance and still view the work of an individual student in that effort. They can also work with students one-on-one or in a group via built-in audio and video chat. The company's Web site includes a search feature that allows teachers to find their counterparts in other parts of the country or the world for collaborative projects. The program works on iOS, Android, Chromebook, Windows and Mac devices and was named in a list of "best Web sites for teaching and learning" in 2015 by the American Association of School Librarians. "Our new education version is ideal for American classrooms," said CEO Per Emanuelsson, in a prepared statement. "Since it's the first such solution integrated with Google Classroom and fully supports Chromebooks, it takes advantage of the enormous number of Chromebooks in schools — more than half of the devices sold in [the United States] — while meeting the great demand for collaborative platforms that can create music or podcasts." Pricing is set at "less than $5 per seat per year," the company said. Among the educators who have used Soundtrap are teachers in Angola High School in Indiana, Massapequa School District in New York and Monmouth Beach School District in New Jersey, among others. The company claims more than 1,000 schools among its user base.